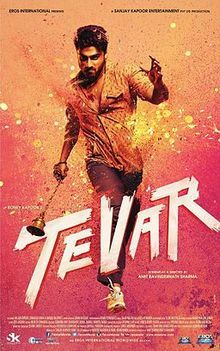 Tevar is a Bollywood action film directed by Amit Sharma and written by Gunasekhar. The film stars Arjun Kapoor, Sonakshi Sinha and Manoj Bajpayee in lead roles. It is a remake of 2003 Telugu Blockbuster Okkadu starring Mahesh Babu. Pintoo is a young Kabbadi player who goes to factionism hit Mathura to take part in a life changing match, which decides his sports future. There, in a twist of fate, he saves Radhika from Gajendar Singh, a dangerous faction leader, who is in love with Radhika and wants to marry her against her wishes. Pintoo tries to comfort her because Gajendar Singh killed both brothers of Radhika. Pintoo brings Radhika to his house in Agra and decides to send her abroad to save her from Gajendar Singh. This is complicated by the fact that Radhika falls in love with Pintoo and that Pintoo dad is the top Cop in charge of finding Radhika, as per the order of corrupt home minister of the state. The home minister is into helping Gajendar Singh. Pintoo conceals Radhika in Charminar, this forms an integral part of the story. Whether Pintoo is able to achieve his Kabbadi target and whether, Radhika & Pintoo unite is the crux of the story. The film released on January 9, 2015. Toyota Center is excited to welcome SLAM THE TOUR (Sound, Light, Music, Action), Bollywood biggest global musical extravaganza on Friday, September 19th! The mega blockbuster concert features Mr. Shah Rukh Khan, Mrs. Farah Khan Kunder, Ms Deepika Padukone, Mrs Malaika Arora Khan, Mr Abhishek Bachchan, Mr Boman Irani, Mr Sonu Sood, Mr Vivaan Shah, Ms Kanika Kapoor and Mr Yo Yo Honey Singh. With the magical chemistry between lead performers Khan and Padukone, plus a cast and crew of 130, this is the largest and most exciting Bollywood production Houston has ever seen. Don™t miss your chance to see the superstars of Indian Cinema together on stage this September. Talking about the tour an excited Shah Rukh Khan, said, "I am blessed to get a lot of love and support from people around the world. This is our way of giving this love back and thanking you all. I am super excited and looking forward to being in your city along with my colleagues Farah, Deepika, Madhuri, Malaika, Abhishek, Boman, Sonu, Vivaan and Kanika. We promise you an evening of love, laughter and entertainment. So mark your calendar and be there at SLAM, THE TOUR." The tour is currently scheduled for the following cities - Houston, New Jersey, Washington DC, Chicago, San Jose, Vancouver and London. Salim and Sulaiman have been composing music for over a decade having scored for movies like Rab Ne Banadi Jodi, Fashion, Roadside Romeo, Iqbal, Dor And Kaal to name a few. Having worked on a wide range of genres they have developed a unique understanding of cinema and a keen sense of knowing when to score and when to leave silences depending on the performances. 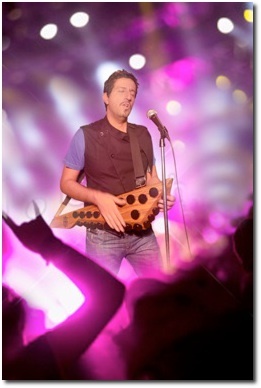 Salim-Sulaiman will be touring the United States and Canada in March 2012. This is their first North American Tour and you will not want to miss them singing ALL of their hits! The duo will be performing their hit songs such as Shukran Allah, Ainvayi, Ainvayi, Chak De, Dance Pe Chance among others. They will also be accompanied by Benny Dayal, Shraddha Pandi and Shadas Faridi. For more details on ticket prices and how to book them click here. The tour is currently scheduled for the following cities in the US - Dallas, Houston, Atlanta and Washington DC. 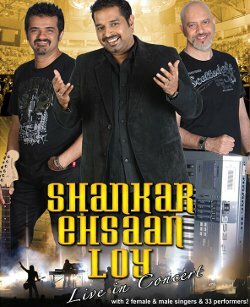 Shankar-Ehsaan-Loy is an Indian musical trio consisting of Shankar Mahadevan, Ehsaan Noorani and Loy Mendonsa. Record producers, musicians and multi-instrumentalists, they have composed music for over fifty soundtracks across four languages. Among the most critically acclaimed Indian musicians, the trio have won over twenty awards, including one National Film Award, three Filmfare Awards, three IIFA Awards among several other awards and nominations. They are often referred to as "Amar Akbar Anthony" of Hindi film music by several, including eminent critic Rajeev Masand. Following the popular practice in Bollywood music where individuals with varied musical backgrounds collaborate together, Shankar Ehsaan Loy are the first Bollywood trio of music composers. Exploiting the unique strength of its members -- the Indian classical music of Shankar Mahadevan, the rock and acoustic pop of Ehsaan Noorani, and the electronica-fusion of Loy Mendonsa -- the trio has created successful music that is both traditional and progressive. Displaying a formidable presence even before the release of their first album, Shankar Ehsaan Loy debuted with Dus, the soundtrack to a film that was never released, although the recording was still highly appreciated in music circles. The trio had a successful tour of the US in 2011 and back in the US this summer with tour dates in New Jersey, DC, North Carolina, Detroit and Dallas. See below for all tour information.